This Web site contains information about drug abuse as well as sections designed specifically for parents, teachers, and students. This printable/downloadable teacher’s guide accompanies NIDA’s Mind Over Matter series. The series is designed to educate teens about the biological effects of drug abuse on the body and brain. Buzzed: The Straight Facts About the Most Used and Abused Drugs from Alcohol to Ecstasy. Kuhn, C., Swartzwelder, S., and Wilson, W. New York: W. W. Norton & Company, 2003. A highly informative, detailed review of widely abused drugs. 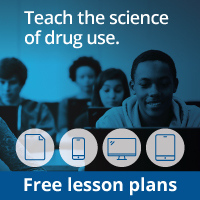 Designed for teens, this site includes information about how different drugs, including inhalants and opioids, affect the brain. Also available for free by calling 1-800-729-6686. Designed for teens, this site covers the risks and consequences of various drugs and provides news, advice, and real-life stories. Ritalin and Other Methylphenidate-Containing Drugs. Ferreiro, C. Philadelphia, PA: Chelsea House Publishers, 2003. Part of the “Drugs: The Straight Facts” series. The book provides a thorough discussion of Ritalin and ADHD, with facts about abuse. Inhalants. Lobo, I.A. Philadelphia, PA: Chelsea House Publishers, 2004. Part of the “Drugs: The Straight Facts” series. Provides useful information about the different types of inhalants, how they act on the brain and body, usage trends, and health effects. Prescription Pain Relievers. Foster, O.M. Philadelphia, PA: Chelsea House Publishers, 2005. Part of the “Drugs: The Straight Facts” series. Contains a thorough discussion of prescription pain relievers, including how they act in the brain, health effects, and usage trends. This book helps students understand the connection between these prescription pain relievers and how the brain changes as a result of the use of these substances.